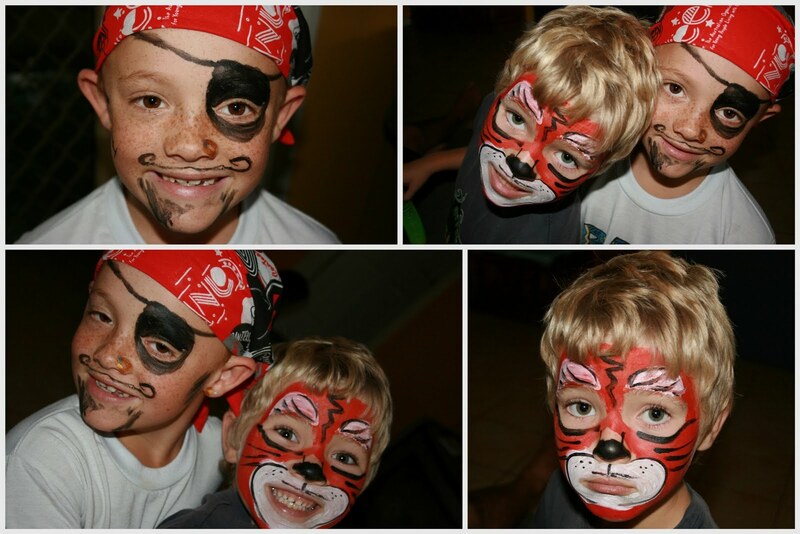 Afterwards Jack and Riley went to the markets with nana and came back with their faces painted. Too cute! Can't believe Riley is 7 already! We went to the pool with the Reids/Gaeblers/Coopers/Mudrochs. We had a sausage sizzle and cakes and then the kids went on the Eliminator Water "Slide" and can you believe I forgot to take my camera!? (Well I forgot to check that when I asked a child to grab it and put it in the car, that he actually did it...!!) Never mind, got some action on the phone camera but it's just not the same! 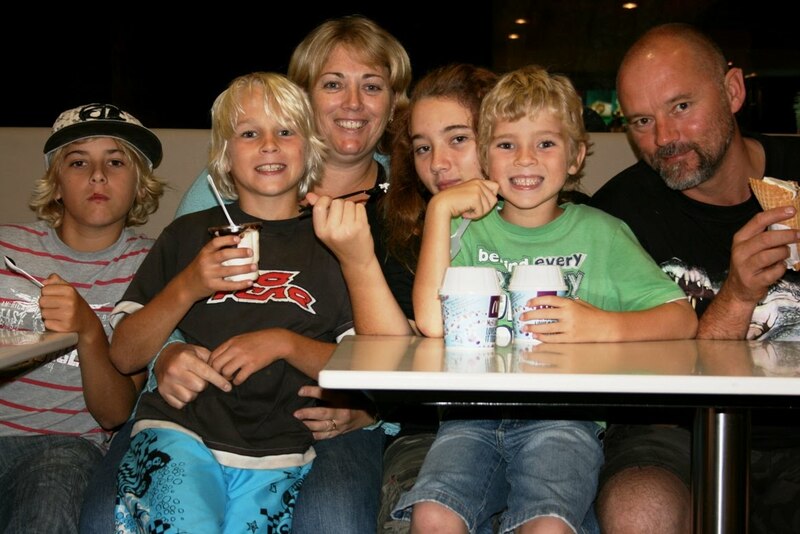 We went to McDonalds for Riley's birthday tea. (Thanks Wards for sharing that idea about the birthday person choosing what's for dinner on their birthday!) Afterwards (because I did remember the camera! ), we set the timer and took some self portraits. Someone offered to take one for us, but I find running to get in front of the camera without squishing some one, much more fun! 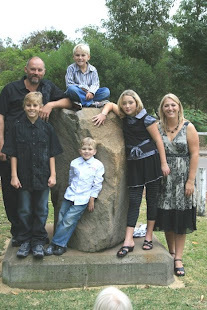 Finally, my friend Cass and her hubby and 2 beautiful children came for a visit. She's tried to come many times over the years but never quite got here, and her hubby's never been so it was loveley that they got here. At the moment they are on my dressing table. I haven't labelled the drawers as I wasn't completely sure what I was going to use them for...I just wanted to make them! I used Gypsy Sisters Range. Using the pps I won from the last monthly sketch challenge! Love this photo of Riley playing in the sprinkler. This one I did just for fun. Right, think that post is quite long enough. Off to lunch now for a friends birthday and hopefully this avo I can update with my big news and then I can just do small updates daily or weekly, not whole months at a time! You are one busy lady... I am going to use the sketch of your layout "Some days" and do a digi one.I love all the layers on it... will let you know when i do it! Great blogging Rach. 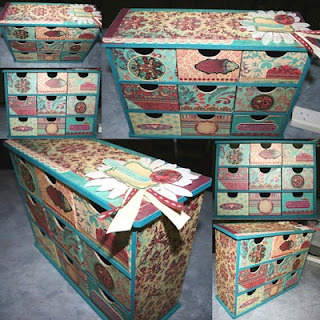 And those Kasier drawers are just goregous!!! I want them (lol).